At Hearing Solutions, our team of experts includes more than 25 qualified and experienced full-time Audiologists and Speech Language Pathologist who undergo regular training to keep them updated with the latest technology. Next to the common cold, ear infections are the most common disorder in children. An ear infection can be caused by bacteria or a virus. It happens when fluid builds up in the area behind your baby’s eardrum and then becomes infected. Normally any fluid that enters this area leaves pretty quickly through the eustachian tube, which connects the middle ear to the back of the nose and throat. But if the eustachian tube is blocked – as often happens during colds, sinus infections, even allergies, the fluid gets trapped in the middle ear. Germs breed to grow in dark, warm, wet places, so a fluid-filled middle ear is the perfect breeding ground. As the infection gets worse, the inflammation in and behind the eardrum also tends to worsen, making the condition more painful. Usually, fever may develop as your baby’s body attempts to fight the infection. The medical term for this condition – a painfully inflamed middle ear, an accumulation of fluid, a red eardrum, and occasionally a fever is acute otitis media (AOM). Children are prone to ear infections because their eustachian tubes are shorter, less angled, and floppier than an adult’s, which means that both fluid and germs are more likely to get trapped in the middle ear. Also, a child’s immune system is still developing, so they have a tougher time than adults, in fighting off viruses and bacteria. You really think tinnitus can’t be cure! right? When your baby pulls, grabs, or tugs at his ears – this could be a sign he is in pain. Diarrhea or vomiting –the bug that causes the ear infection can also affect the gastrointestinal tract. Reduced appetite –ear infections can cause gastrointestinal upset. They can also make it painful for your baby to swallow and chew. Yellow or whitish fluid draining from the ear. 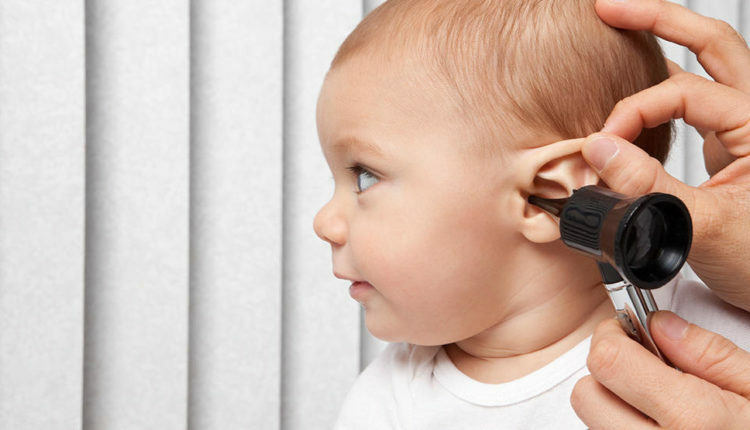 Unpleasant smell –you may detect a foul odor coming from your child’s ear. Difficulty sleeping – laying down can make an ear infection more painful. To lessen your child’s discomfort from an ear infection, your child’s pediatrician may recommend acetaminophen or ibuprofen. It’s best to avoid over-the-counter eardrops unless your child’s doctor recommends them, as they can cause permanent damage if your child’s eardrum is perforated. Breastfeed –studies show that six months of exclusive breastfeeding can protect a child from various infections and diseases. Eardrops or a warm compress held to your child’s ear may also help. Encourage your child to drink more fluids because swallowing helps to drain the middle ear and relieve painful pressure. 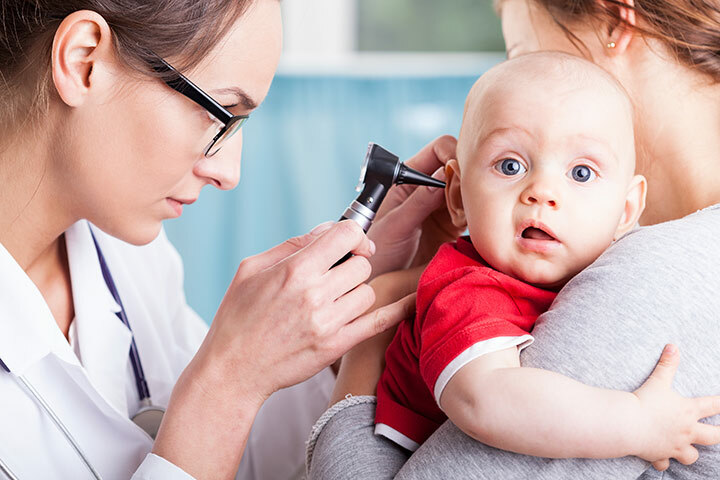 Your child’s doctor may suggest a surgical solution because a baby with persistent fluid in his ears (or otitis media with effusion) is a prime candidate for repeated ear infections and hearing loss. Don’t let your child drink from a bottle or sip cup while she’s lying flat. When your child is drinking, her head should be higher than her stomach so the liquid can’t flow from the eustachian tube into the middle ear. Have your child vaccinated routinely. 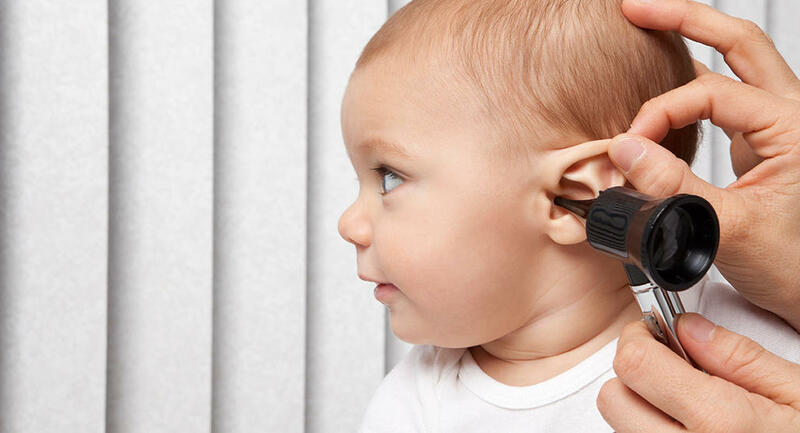 Repeated ear infections can sometimes cause hearing loss and scarring. And in very rare cases, untreated ear infections lead to mastoiditis (a skull infection behind the ear) or meningitis.